Nice Leica. How Much for the Box? Above is a beautiful Red Dial IIIf with 5cm Summitar. Looks to be in exceptional condition considering it’s going on 70 years old, but it’s also just a classically beautiful camera irrespective of age. 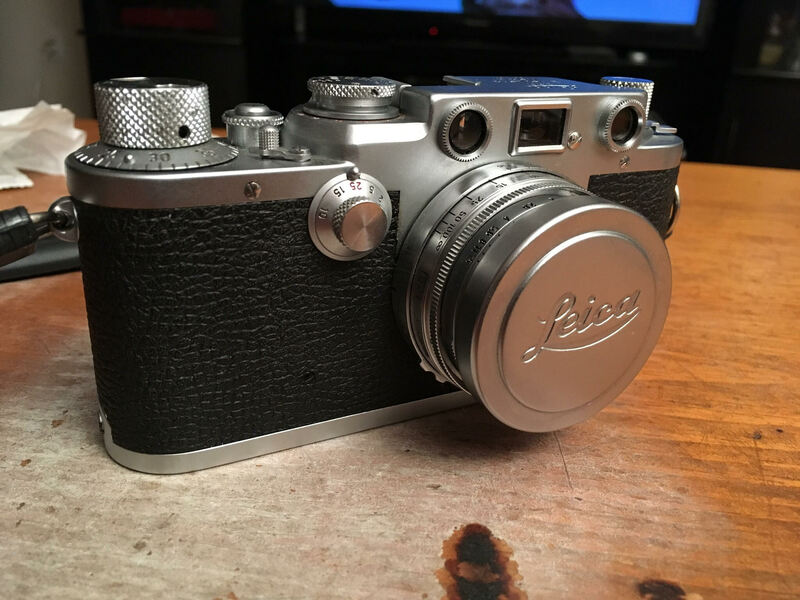 That’s the beauty of old Leicas really, the fact that they might still appeal aesthetically, not merely as something “vintage,” but just as a camera, a tool to use to photograph things. As for its functional utility, I’ve covered that ground ad nauseum here in the past. Pick that Red Dial up, learn which way the knobs turn, point it at stuff and shoot. Works perfectly, and there’s no need to run RAW files through B&W emulation software or add grain in post production, assuming you’ve figured out how to load it with film. That camera and a roll of HP5 comes close to my idea of photographic nirvana. As for the Summitar, I’ve never used one so can only tell you of what I know second hand. Leitz made them between 1939 and 1955 in collapsible thread mount. It was a seven-element improvement of the six-element Summar Leitz produced between 1933 and 1940. Apparently the Summar was pretty soft at f2 and “suffered from” vignetting (which begs the question of whether vignetting is bad; I think most b&w photos benefit from marginal vignetting). The lens coatings were soft as well. It’s almost impossible to find a Summar these days without obvious coating issues. 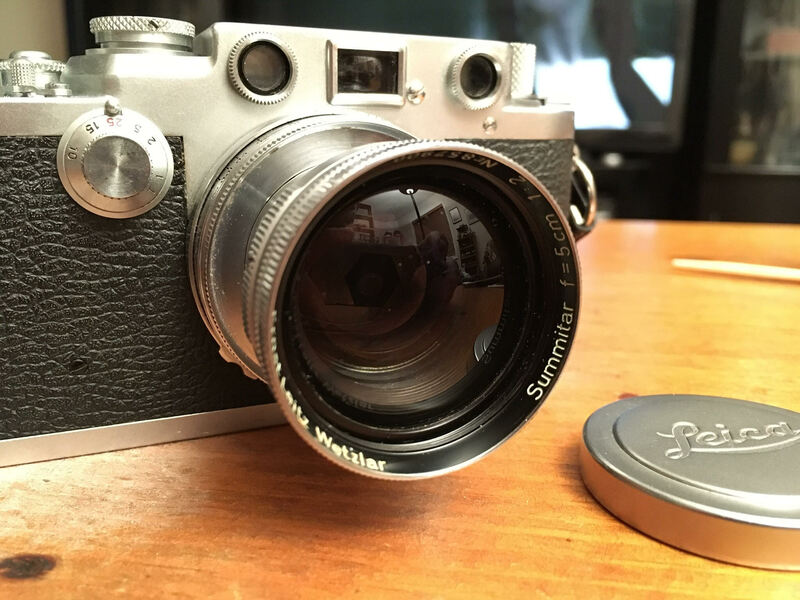 As for the Summitar, it made way for the legendary Summicron and is now mostly forgotten. In any event, given its pedigree, it’s the perfect compliment for the Red Dial. 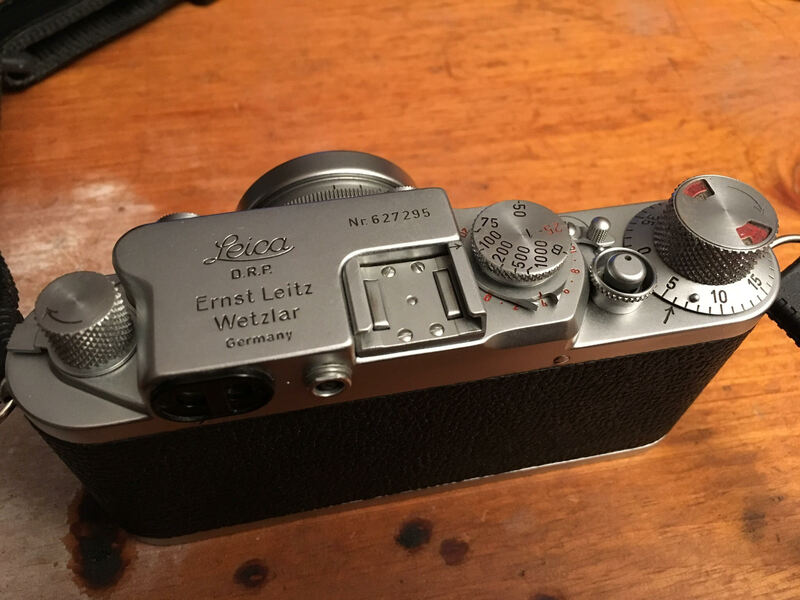 The camera is owned by a reader, someone who emailed me a few weeks ago to say hi, thank me for the blog and tell me he was coming into some Leica equipment via a friend’s death. He wasn’t sure just what it entailed but he’d get back to me once he received it. The Red Dial and Summitar are what he got. I’m envious. It’s a beautiful rig; you rarely see a Red Dial with bright, unfaded red lettering, and a critical look at the top-plate, bottom plate and lens exterior indicates the camera hasn’t seen much use. In addition to the camera, he received a number of boxes, not for the Red Dial but rather one for an M6TTL and one for a Tri-Elmar. Unfortunately, they were empty. The Tri-Elmar in particular would have been a nice find, as they’re going for insane amounts of money these days, why I’m not quite sure. I owned one 15 years or so ago, and found it the antithesis of those qualities that made Leicas desirable – it was big, clunky, slow, counterintuitive. I never used it and sold it off at a loss (under $1000), given it was the first version, which at the time was considered inferior to the second version for some arcane reason. Now, given the peculiarities of Leica ownership, a decent copy will set you back anywhere from $3500-$6000. Sigh. Interestingly enough, as I noted to my reader, the boxes for the Tri-Elmar and M6TTL were probably worth the value of the Red Dial body, assuming he found someone foolish enough to pay the going price. Which of course, is crazy, but then again, there is nothing totally rational about the value of things Leica. This entry was posted in Collectible Leicas, Leica III and tagged IIIf Red Dial on October 15, 2017 by Leicaphila.